Larry Golub is a litigator who focuses his practice on a wide range of litigation matters for both insurance and non-insurance clients. With more than three decades of civil litigation experience, his practice focuses on insurance coverage and class action litigation, regulatory work and appellate matters. In addition, Mr. Golub devotes a portion of his practice to employment matters, agency disputes and banking issues. In addition to representing insurance companies, Mr. Golub's clients include insurance agents, brokers and insurance trade associations. He regularly defends against lawsuits brought under California’s Unfair Competition Law and the federal RICO Act. 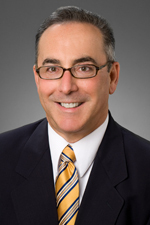 Mr. Golub became a partner at Hinshaw & Culbertson LLP in October 2014 upon the merger of Hinshaw and the Los Angeles-based firm of Barger & Wolen LLP. He has been practicing law in both state and federal courts in California for over 34 years. Defended a health insurer in a nationwide class action as to termination of block of insurance and alleged claim of improper premium increases, first defeating nationwide class at pleading stage, California statewide class as to termination issues on certification motion, and California statewide premium class on summary judgment. Defended a life insurer in California statewide annuity litigation, obtaining denial of fraud, breach of contract and bad faith claims following certification motion. Also obtained dismissal of the plaintiffs’ claim for treble damages for unfair competition causes of action, ultimately taking the issue to the California Supreme Court, where the dismissal was affirmed in a written opinion. Represented numerous insurers in multiple actions involving hundreds of workers’ compensation claims brought by air ambulance companies, resulting in dismissal of claims before a federal court and two state courts. Class action litigation on behalf of life insurers for claims alleging deceptive sales to senior citizens. Class action litigation arising from earthquake claims against property & casualty insurers. Liability coverage under excess policies concerning claims ranging from wildfires to transformer explosions to environmental pollution to asbestos to construction defects. Liability coverage issues, including primary and excess, exhaustion, aggregate limits, equitable subrogation and contribution. Unfair business practices claims, including sales, claims adjusting, reserve and experience modifier practices, non-renewal and title insurance issues. Mr. Golub speaks regularly on insurance-related claims handling topics for continuing legal education providers, clients and trade organizations. He has been the interviewed and provided commentary on A.M. Best TV's Best Day podcast. Mr. Golub is a co-author, with Hinshaw partners John S. Pierce, Robert G. Levy and Travis Wall, of "Defending the Insured," which was published by Aspen Publishing in 2004 and updated in 2008. Mr. Golub has been quoted in many publications, including Law360, The Recorder and the Insurance Journal. He is also an editor and regular contributor to the firm's Insurance Litigation & Regulatory Law blog. "Nature and Types of Life Insurance," Chapter 20 (Revised), "California Insurance Law and Practice," LexisNexis Matthew Bender, 2016. "Two Coverage Cases Wind Their Way Through the California Supreme Court," Claims Journal, January 2014. "Excess Insurance and the Primary/Excess Relationship," Chapter 14 (Revised), "California Insurance Law and Practice," LexisNexis Matthew Bender, 2014. "Business General Liability Policies," Chapter 49," "California Insurance Law & Practice," LexisNexis Matthew Bender, 1992, 2005 and 2013. "Directors’ and Officers’ Liability Insurance," Chapter 43 (Revised), "California Insurance Law and Practice," LexisNexis, April 2013. "A Duty (to Settle) Too Far," Insurance Journal, September 2012. "Identifying and Using Insurance Coverage in Business Litigation," California Continuing Education of the Bar, 1984, 1988, 1989, 1991, 1993, 1998, 2001 and 2003. "Analyzing Coverage: Reading and Interpreting Insurance Policies and Claims Involving Excess Insurance, California Liability Insurance Practice: Claims and Litigation," California Continuing Education of the Bar, 1991 and annual updates. "Insurance Coverage for Employee Claims," "Advising California Employers 2d," California Continuing Education of the Bar, 1996 and annual updates. "A Checklist for Insurance Coverage in the Employment Litigation Context," Western New England Law Rev., Vol. 18, Issue 1, 1996. "Products Liability Insurance," Chapter 47, "California Insurance Law & Practice," LexisNexis Matthew Bender, 1992.